Posted on January 31, 2017 at 10:28 am. Casino operators all around the world are presenting for Japan, as the nation’s lawmakers draw up legislation for the new gambling powerhouse destination. 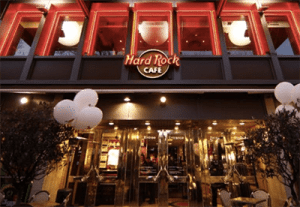 Hard Rock Cafe has expressed interest in the casino IR market in Japan. Following the decision to legalise casino gambling in Japan, a team of three dozen bureaucrats are drawing up legislation to explain how the industry will be regulated. Despite the new Japanese gambling laws not due until December, global operators, including MGM Resorts and Hard Rock Café International are already trying their hand at winning a spot. Insiders have suggested local authorities will team up with these operators to bid for licenses which are required to be full-scale resorts – not just casinos but hotels, retail outlets and entertainment spaces too. Hard Rock has a strong stance in America and the company’s senior vice president for development in Asia, Daniel Cheng, has said it’s been talking with local firms and banks in Tokyo this month. This hasn’t stopped the criticism of Japan allowing casinos, which Hard Rock also addressed. “We should be transparent in explaining both the positive and potential negative impacts of an IR industry for Japan,” Mr Cheng said. Chairman and CEO of Las Vegas Sands, Sheldon Adelson, believes the company is a strong contender due to Japanese officials visiting the Singapore casino and plans to travel to Japan next month. “Prime Minister (Shinzo) Abe has visited the property, he was very impressed with it, so I think it’s going to be modelled after our property, the Marina Bay Sands in Singapore,” he said. While MGM lost out to Sands in Singapore, the company told Reuters it has boosted staff and resources to be in the running. “The opportunity that Japan represents is one of the most significant anywhere in the world,” said MGM executive vice president of global government and industry affairs, Alan Feldman. An analyst at Union Gaming in Macau, Grant Govertsen, has said the companies who will win licenses will depend on the strategies used. “Regardless of the structure, there will be significant interest from international developers,” he said. While locations and operators are predicted to be chosen by 2019, it is said Tokyo may not be considered due to a full scale resort being hampered by the Olympics in 2020 – though it’s being predicted any casinos won’t be completed until 2023. What’s more, Japan as a new gaming powerhouse destination has even more appeal due to the wealthy population and the impact global operators have endured due to China’s gambling crackdown hitting revenues hard in Macau. Where can Japanese players play online? Anyone living in Japan can play at several of the world’s best offshore online casino sites we review on this site, which are all licensed and regulated in trusted gaming jurisdictions such as Malta and the United Kingdom. If you are a reader from United States, our top rated online casino we suggest you check out is Raging Bull Casino, which offers hundreds of real money slots and table games playable on desktop, laptop and mobile devices.